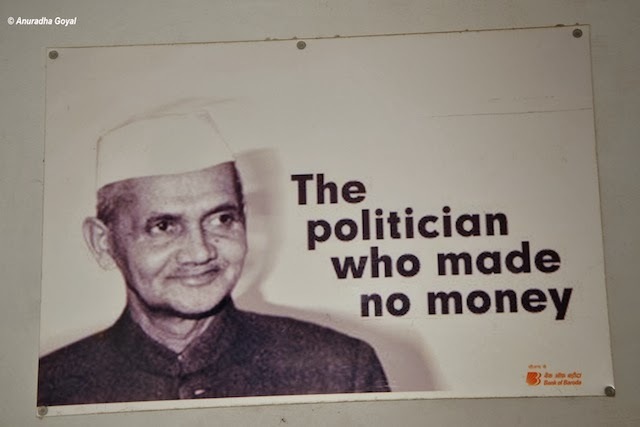 These days, when Indian politicians are accused of amassing illegal wealth and having Swiss Bank accounts, can you imagine that the second Prime Minister of India Lal Bahadur Shastri died a poor man, leaving behind a debt for the car loan availed by him from a bank? Lal Bahadur Shastri did not own a car even after becoming the Prime Minister and the family members persuaded him to own a car. Being a simple person, he had only Rs.7000/- in his bank account. A Fiat car cost Rs.12,000/- those days. He applied for a bank loan of Rs.5000/-. When he died at Tashkent on 11th Jan 1966, his loan account was not cleared fully. After signing an agreement with Pakistan in Tashkent (Soviet Union) on 10th Jan 1966, he died in his hotel room on 11th Jan 1966 reportedly due to heart attack. Though his family members raised doubt about his mysterious death, till date the cause of his death remains unknown. The Prime Minister’s Office, while refusing information under the RTI Act on the cause and the circumstances of Shastri’s death, said that disclosing this information could harm India’s foreign relations and also violate Parliamentary Privilege. Unfortunately, the simple and efficient Prime Minister is forgotten in history forever. Born into a teacher’s family on 2nd October 1904, Sashtri joined the freedom movement in early 1920s. He spent more than 9 years in the jail on various occasions. As General Secretary of the Congress Party, he played an important role in the landslide victory of the Congress Party in the Indian General Elections of 1952, 1957 and 1962. He served as the Minister of Railways in the Central Government from May 1952. In December 1956, he resigned, accepting moral responsibility for a railway accident at Ariyalur in Tamil Nadu that resulted in 144 deaths, even though the Railway Minister was not responsible for such accidents. Lal Bahadur Shastri took over as the Second Prime Minister of India, after the death of Pandit Jawaharlal Nehru on 9th June 1964. At that time the country was facing a huge economic crisis, besides troubles created by China and Pakistan in the border. He implemented the Green Revolution and the White Revolution in the country to increase grain and milk production. He even appealed to the people to give up one meal, so that the saved food could be given to needy people. He gave importance to the Jawans and the Kisans, by coining a slogan, “Jai Jawan; Jai Kisan”. Shastri's greatest moment came when he led India to victory in the 1965 Indo-Pak War. It was during the signing of the Tashkent agreement between Pakistan and India that Shastri had mysterious death. The nation remembers Lal Bahadur Shastri with reverence, and salutes him for his contribution to the nation. Does AAP’s media obsession lead to anarchism?